Basic first aid is essential in responding quickly and appropriately in a medical emergency. 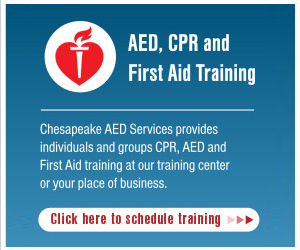 Chesapeake AED Services offers American Heart Association (AHA) Heartsaver® First Aid in Baltimore Maryland. Training is completed in a classroom, hands-on and and instructor-led, teaching students critical skills to respond to and manage an emergency in the first few minutes until emergency medical services (EMS) arrive. The AHA Heartsaver® First Aid will also review key changes reflecting the new science and advances directly from AHA guidelines. Upon completion of this course, students receive an American Heart Association Heartsaver® First Aid Course completion card, valid for two years. These courses are for anyone with limited or no medical training interested in basic lifesaving skills as well as those who need a course completion card to meet job, regulatory or other requirements. Heartsaver ®First Aid is a classroom, video-based, instructor-led course that teaches students critical skills needed to respond to and manage a First Aid, choking or sudden cardiac arrest emergency in the first few minutes until emergency medical services (EMS) arrives. Students learn skills such as how to treat bleeding, sprains, broken bones, shock and other first aid emergencies.